I've recently been reading so many wonderful posts on Earth Day ideas to do with little ones and I was so inspired that I just had to go and get some seeds, pots and soil and teach my son how to garden. Tyler Lee has already shown a great interest in the garden, following his Daddy around as he waters the plants and wanting to have a go at the watering can too - so sweet. 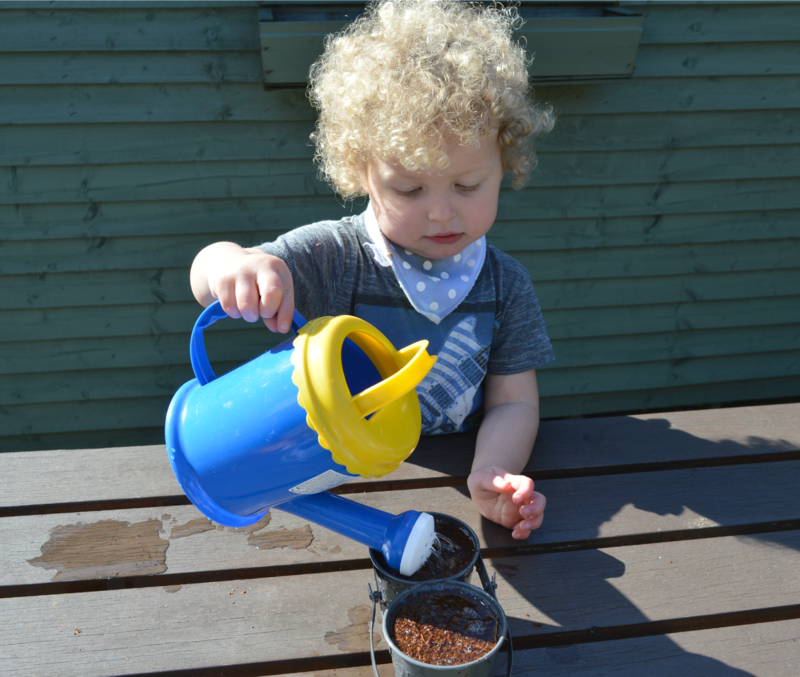 I picked him up his own little watering can to entice him to take part in the potting and he really loved it! Earth Day is celebrated on April 22nd every year since 1970. The day serves to make people aware of the importance of keeping the Earth healthy and clean - these are things I really want my son to be aware of throughout his life. It's so important for us to be as ecological as we can as a family. We reduce, reuse and recycle whenever we can, we opt to walk whenever we can instead of using the car, we don't litter, we use eco-friendly products and although we don't have a garden with any soil to plant in (it's covered in stones) we try to garden as much as we can with potted plants. These are all little things but if everyone did these things then maybe the Earth would be more well looked after for future generations than it is at the moment. I picked up four packets of flower seeds from my local Dealz, all for just €1.49 - Sweet Pea, Marigold, Field Poppy and Candy Tuft, all which are gorgeous looking flowers - if they grow of course! The metal bucket pots were also just €1.49 each and I thought they'd be perfect for my little one to carry around too. The first drop of water. Happily looking at his pots and seedlings. Lovingly looking at his watering can - who knew they could be such fun?! This gardening lark is serious stuff! His Daddy and I showed him how to fill up the pots with soil, how to sprinkle in the seeds and then to pat more soil on top. Of course, we had to let him test out his new watering can and give the seedlings their first drop of water. He was a dab hand with the watering can - if a little too enthusiastic with the amount of water he was giving them all, but it was all in fun so we let him at it. It was great to get Tyler Lee involved in potting the seedlings, now that he's older it's so much fun to do these activities with him and get him involved with things we're doing around our home and garden. He had so much fun watering the other plants too, I think the novelty of having his very own watering can was something great for him and it was so lovely to see him getting involved, helping out and being genuinely interested in the garden. Our seedlings are now in their pots and are on top of our picnic table, as that's where the sunlight is best in the garden. It'll be great if they grow so that we can show Tyler Lee the efforts of his green fingers and if they don't we can always try again. It's so lovely to see him pottering about the garden and I hope his love of gardening just grows and grows (no pun intended!) as we teach him more to garden and he sees his efforts growing and blooming. On Wednesday, the actual Earth Day we may plant some more and go for a picnic in a local green area when Tyler Lee is finished play school. These are all such simple activities but if they make my son aware of how important it is to be green and how to look after the Earth then the result is immense to me. Will you be doing anything to celebrate or join in with Earth Day 2015? My toddler loves gardening too. I think it's great to encourage a love for nature and an appreciation for how things grow. Bet he is excited to see flowers!! It's lovely to see how much they enjoy it isn't it? It really is a great skill to encourage them in. I'm sure he'll be delighted when he sees his flowers. What a cute boy. I have been spending a lot of time outside with my toddlers lately. It is amazing how curious they are about nature. We recently planted a pot vegetable garden and our seeds are starting to sprout. Hi Fiona - this is such a sweet and timely idea - my son loved to play in the dirt as a toddler - and did some beautiful gardening for the conference center where we worked - when he was just out of high school - so we all enjoyed the planting as you shared your joy here :) Hugs :) What a sweet little guy you have, too! I was hoping to do some gardening myself, but the ground is still very much frozen here in Southern Ontario. I think it's really great to see that the there are some keen on making sure that the next generation retains a connection to the Earth. What a wonderful way to celebrate Earth Day! It is great that you are teaching your son how to garden. He will thank you for it someday. How adorable is he! We spent an afternoon planting plants in our garden a few weeks ago. The kids had a blast helping and enjoy watering them often. My dad first taught me to garden. This is such a wonderful idea and I love his curls. Your little one is so cute and handsome gardening. My kids love gardening too. They love watching their plants grow. Those little pots are such cute colors! I need to see if I can find something similar stateside. You have a sweet helper! Aww how cute is he water the pots, its so important to teach the next generation the importance of Earth day and impact we can have if we all tried. I need to plant some plants in for my new apartment. Omgoodness...he is going to be so excited when things start to grow. He looks absolutely adorable watering the pots. My daughter is a big gardener and I have a black thumb!! Its fun to see how much they find something they enjoy doing something they love!